Tel Aviv, Israel. A quartet of thieves are hiding out in a hotel room, discussing their next heist, when one of them hears a noise behind the door. He swings it open to find a cleaning lady listening in on their conversation. Before they can do her in, the cleaning lady’s cart transforms into the Chameleon! Chameleon grabs the cleaning lady (actually his partner, Val) and they escape through the window. Later, at their hotel room, Chameleon tries to profess his love to Val, but she’s not interested. Besides, they’re being paid to thwart the thieves and they need to get to New York to do it. Now moping, Chameleon considers quitting the job altogether, until he sees McIntyre’s report on the mysterious mutant turtles on Inside Affair. Knowing that the Turtles are in cahoots with the Shredder (the one who turned him into a mutant), Chameleon resolves to go to New York and get some answers. At the Internal Affairs studio, McIntyre is bickering with his laidback cameraman, Squint. McIntyre is upset that the biggest story of the year, the Turtles, have apparently vanished off the face of the Earth. He knows April is somehow connected with them and demands she be followed. After everyone leaves the studio, one of the cameras transforms into the Chameleon. Chameleon calls Val, telling her to bug April’s phone. Val is reluctant, as they have a job to do, but Chameleon persuades her to do him a solid. At April’s apartment, Oyuki is sneaking a smoke when Michaelangelo calls. The Turtles have just returned from Dimension X and they want to hang. Sadly, April and Oyuki are covering a story and can’t get together. 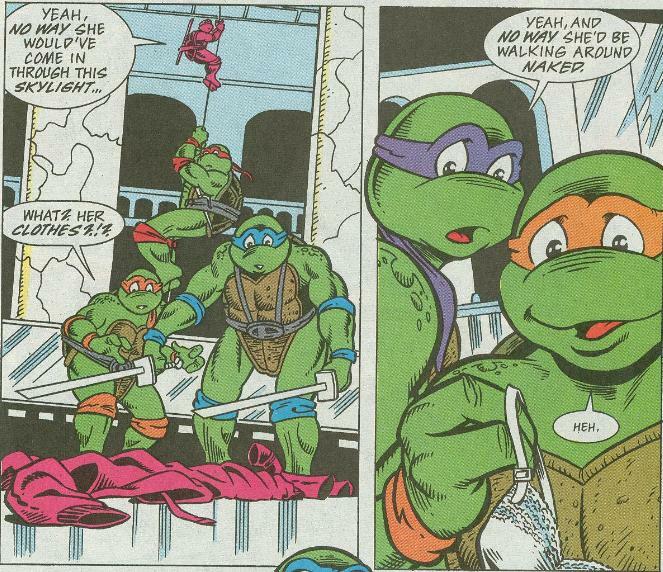 Meanwhile, Splinter thinks something may be wrong with Donatello, who seems melancholy after his latest adventure. As Chameleon spies on the thieves in their New York digs (learning they plan to loot a museum), he gets the news from Val, tracing the call to the sewers. Down in the lair, an evening of Rock em Sock em Robots is interrupted by April running by the entrance, cryptically beckoning the Turtles to follow. Hesitant at the weirdness of her behavior, the Turtles shadow her through the sewers, to the roof of a nearby museum and then down through the skylight, into an exhibition hall. 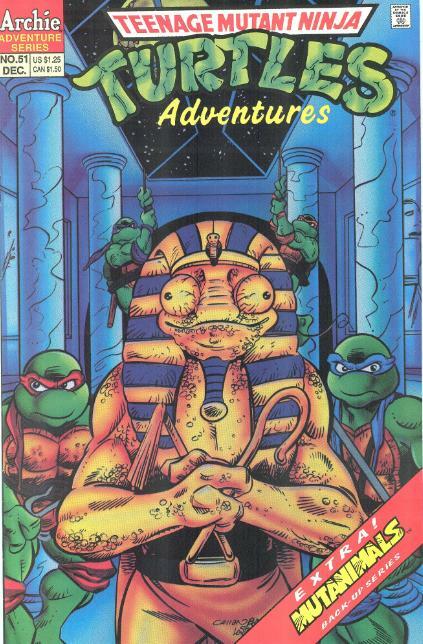 An Egyptian statue proceeds to transform into the Chameleon, who captures Mike in his stomach. Mike frees himself with a blow to the gut and Don ties the Chameleon to a pillar. The Chameleon says he knows the Turtles are agents of the Shredder and demands they tell him if the mutagen that turned them all from humans to freaks is permanent. Leo responds in the following order: No, they do not work for the Shredder. No, they were not humans that turned into turtles, but turtles that became anthropomorphic. And yes, the mutagen is permanent. 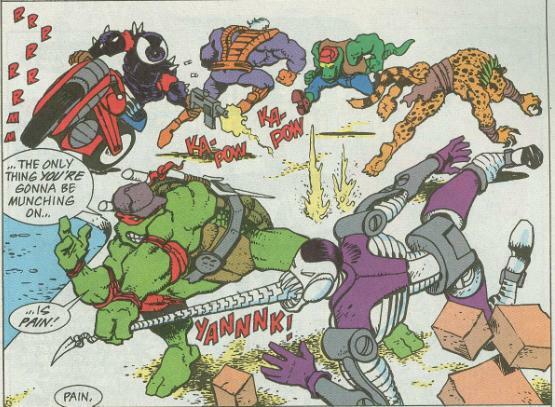 Chameleon is disappointed at the answer (and his poor intel), so he stops playing possum and sends four large pile-drivers out of his shoulders, knocking the Turtles unconscious. Remembering his job, he leaves to deal with the thieves. Raph eventually wakes up and finds his brothers standing before a smashed display case, where they presume the Chameleon stole a statue. As sirens begin to blare, the Turtles opt to flee before they get blamed for the heist. Outside, the thieves abscond with the artifact, not noticing the googly-eyes embedded in the “crate” they’re carrying it in. Thinking, the Chameleon resigns himself to his mutant fate. As the Mutanimals and Future-Raph and Future-Don lay stunned in the pool of water, Dead-Eye urges Lynch to hurry up and electrocute them with the live wire he’s clutching. Lynch is about to do the deed when the tiniest Mutanimal, Screwloose, pops out of his hiding place (having avoided the tidal wave). Screwloose stabs Lynch in the neck with his proboscis, then grabs the live wire and shocks him. Man Ray comes to next and uppercuts Fist. The rest of the Mutanimals and the Future Turtles get their bearings and continue the brawl. Future-Raph begins grappling with Waster, who extends his robotic tongue toward the Turtle’s eye-patch, intent on eating his brain. Raph isn’t about to let that happen and snatches the tongue, giving it a good yank. Meanwhile, Leatherhead and Fist test their muscle, ramming headfirst into each other. *This story is continued from TMNT Adventures #50. The story continues in TMNT Adventures #52. *Codename: Chameleon previously appeared in TMNT Adventures #9. *McIntyre and Squint last appeared, and caught the Turtles on camera, in TMNT Adventures #47. *This issue was published in the UK by Fleetway as TMHT Adventures (#84). It was the final issue of the series. Hey! It’s that guy from forty-two issues ago! They remembered he existed! Woo! Codename: Chameleon wasn’t exactly one of my favorite characters from the initial arc of TMNT Adventures and I don’t think he really struck a chord with the readers or the creative team, either, considering his extended absence from the book. Regardless of that, he fills out a nice breather issue between grand arcs in TMNT Adventures and the story’s decent for what it is. Chameleon has been “upgraded”, I suppose you could call it. Instead of just “blending in” by turning invisible, he can now shapeshift like Clayface from Batman. I didn’t mind this alteration so much, as when we last saw him he was just getting used to his new powers, now a few years have passed and he seems to have found the greater extent of his abilities. It makes just enough sense not to really matter, anyway. What I didn’t care for was Chris Allan’s redesign. He’s now a hulking muscle-bound brute as opposed to the lithe and slippery character from his initial appearance. He’s even lost his tail. And without any clothes, he just looks too generic, now. I rather liked the trenchcoat and fedora ensemble that he wore on the cover of TMNT Adventures #9 and wish that had been retained for his overall design. Now, instead of looking like a sneaky spy, he looks like a refugee from Eternia. But there are still lots of fun nuances that Murphy (Clarrain) and Allan throw in, which make their issues so much fun. 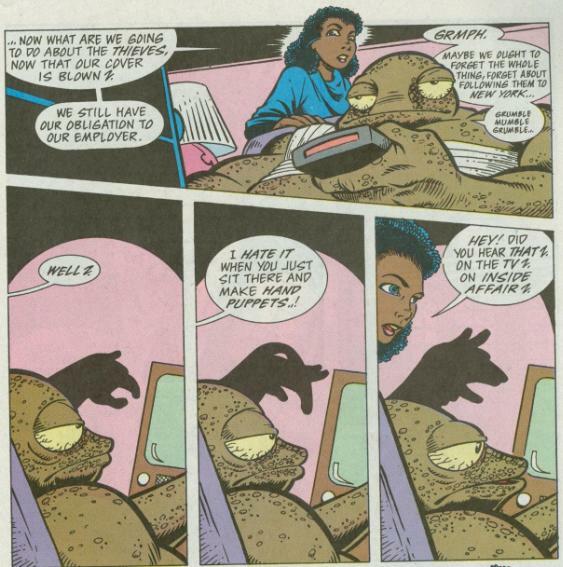 The scene where Chameleon is pouting in front of the TV and ignoring Val’s chatter by making hand-puppets is really amusing, and of course the overall energy in Allan’s pencils go without saying. Gotta give colorist Barry Grossman some credit, too. Though it’s easy to miss, he did a great job making the sewers look all slimy and gross on page 15 by splattering all the white blotches everywhere. A time-consuming bit of coloration for something so small, but it makes a difference in the details. “Chameleons are Forever” isn’t really a memorable story, but it’s a very fun and light way of giving the cast a breather between major arcs while still moving subplots along (namely, McIntyre). As for the Mutanimals back-up, the story is still as dull as a sack of hammers, but the art has taken a major upswing now that Eric Talbot has come to lend Jim Lawson a hand. The backgrounds are still a mass of empty white space, but the action is definitely more intense. Not enough of a change to make this back-up, well… good, but it helps a little. Chameleon was one of my favorite TMNT characters. A Dreadmon meets Chameleon spin-off would have been much better than the Leatherhead & Donatello one. I enjoyed his two issues, he deserved more. Felt like a character with a lot of potential.